Former First Lady Barbara Bush won the public’s admiration for her candor sharp sense of humor, but fashioned herself as a return to a more traditional first lady. (Credit: David Hume Kennerly/Getty Images). 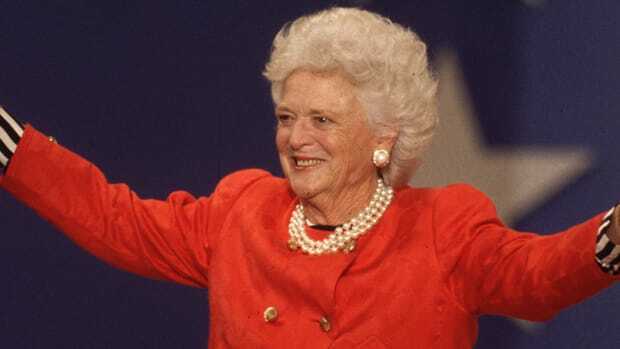 Barbara Bush, the patrician yet salty matriarch of one of America’s leading political dynasties, died on April 17, 2018 at the age of 92 after a years-long battle with congestive heart failure and chronic obstructive pulmonary disease (COPD). 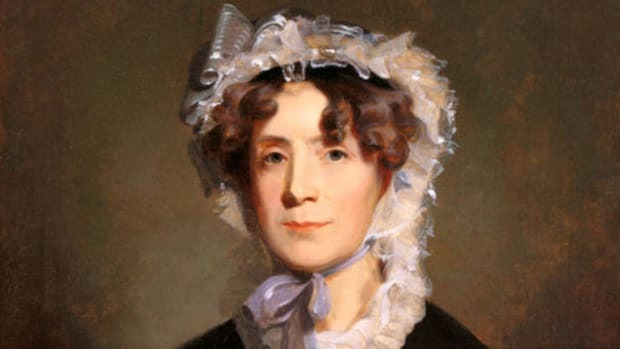 With the exception of Abigail Adams, Bush is the only woman in American history to have been wife to one president and mother to another. She married her high school sweetheart, George H. W. Bush, who served as vice president under Ronald Reagan for eight years before winning the White House himself in 1988. With her particular blend of matronly conservatism and down-to-earth humor, the American public embraced Barbara Bush as a refreshingly traditional contrast to the glitz and glamour (and devotion to astrology) of the previous first lady, Nancy Reagan. In 2000, the Bushes’ eldest son, George W. Bush, mounted his own successful presidential campaign; he would go on to serve two terms in office. Their second-eldest son, the former Florida governor Jeb Bush, also campaigned for the nation’s highest office, losing his battle for the Republican nomination in 2016. 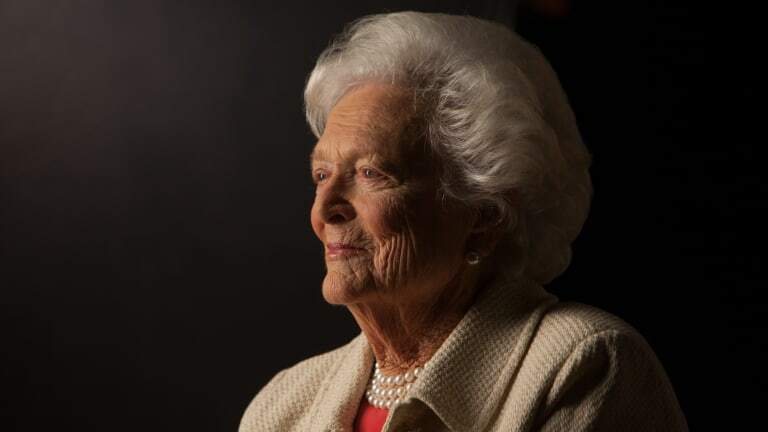 Through it all, Barbara Bush remained among the most popular members of her famous family, presiding over the extended Bush clan, including 17 grandchildren and seven great-grandchildren, in both Houston and Kennebunkport, Maine. Mrs. Bush has been in increasingly poor health in recent years, and in April of 2018 she announced through a spokesman that after a series of recent hospitalizations, she wouldn’t be seeking additional medical treatment, but would be focusing on “comfort care” at her home in Houston, Texas. Barbara Bush with her son George W. Bush and husband George Bush in Rye, New York, 1955. Barbara Pierce was born June 8, 1925 in New York City, and spent her childhood in the New York suburb of Rye. Her father, Marvin Pierce, was president of the McCall Corporation, which published popular magazines such as McCall’s and Redbook. 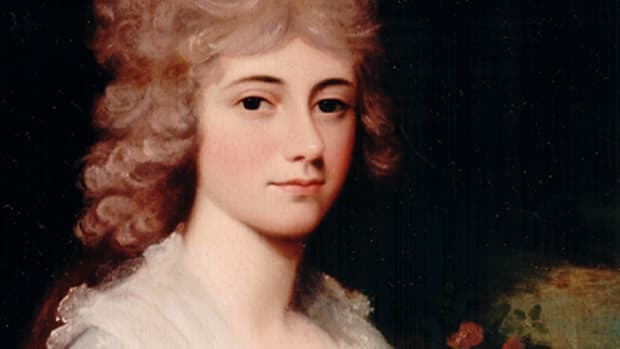 Her mother, Pauline Robinson Pierce, served as chairwoman of the Garden Club of America. Barbara was the third of four children, and had two brothers and a sister. In 1940, Barbara began attending boarding school in South Carolina. The following year, she met George H.W. Bush, who was then a senior at Phillips Academy in Andover, Massachusetts, at a dance in Greenwich, Connecticut, during Christmas vacation. They started writing to each other, and she went to his senior prom with him. A year and a half later, they became engaged, and not long after that George left to serve as a U.S. Navy bomber pilot in World War II. The youngest pilot in the Navy, he flew 58 combat missions, and was nearly killed when his plane was shot down on September 2, 1944. That December, Barbara dropped out of Smith College midway through her freshman year. Two weeks later, when George returned on leave, the couple got married. The date was January 6, 1945. 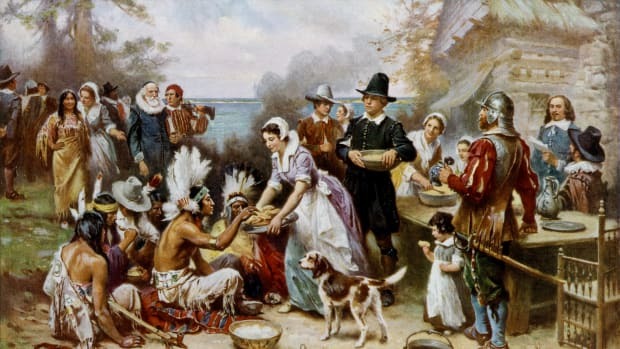 When the war ended, they moved to New Haven, Connecticut, where George would complete his studies at Yale University. 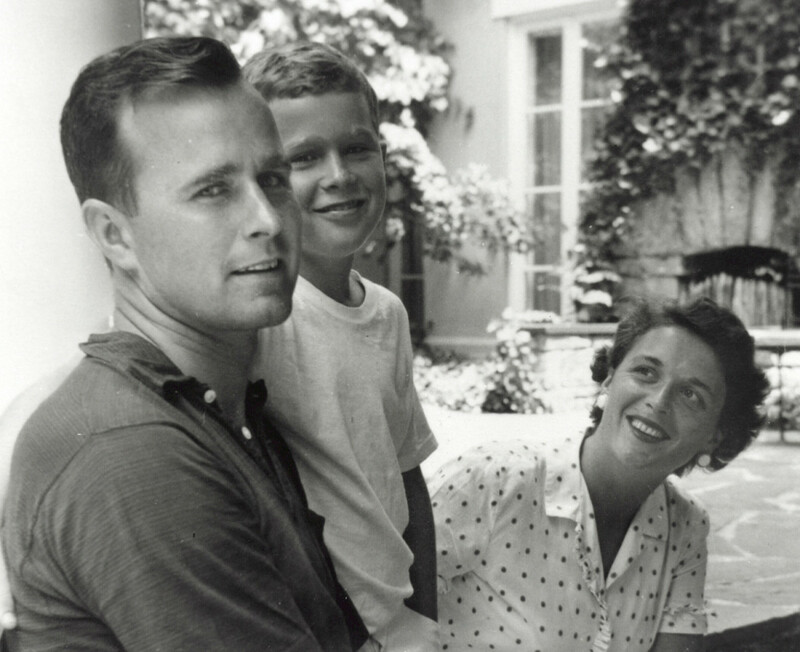 Their first child, George Walker Bush, was born in Connecticut in 1946. After George H. W. Bush graduated from Yale in 1948, the family moved around for a few years due to his work in the oil business before settling in Midland, Texas. In 1953, the Bushes suffered a devastating loss when their second child, Robin, died of leukemia when she was three years old. Only 28 at the time, the grieving Barbara Bush saw her brown hair turn prematurely white during this ordeal. 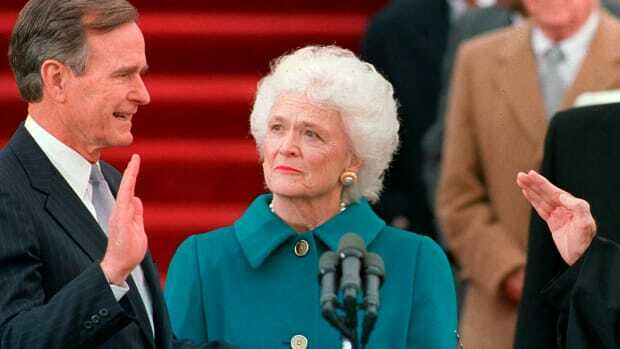 (It later became a hallmark of her appearance, and her husband nicknamed her “the Silver Fox.”) The Bushes donated Robin’s body to science, and would dedicate themselves to raising money for cancer research. After George W. and Robin, the couple had four more children: John Ellis (Jeb), Neil, Marvin and Dorothy. As George H.W. built his business and launched his political career, Barbara stayed at home with the children, taught Sunday school and volunteered for organizations such as the United Way and the YMCA. Forthright and charming, Barbara Bush proved an asset to her husband as he launched his political career. George H.W. Bush was elected to the U.S. Congress as a Republican for the first time in 1966 and would go on to serve as U. S. Ambassador to the United Nations, chairman of the Republican National Committee, chief of the U. S. Liaison Office in the People&apos;s Republic of China and director of the Central Intelligence Agency. In 1980, he ran unsuccessfully for the Republican presidential nomination, before Ronald Reagan chose him as his running mate. All the while, Barbara stood firmly at his side, raising some eyebrows with her pro-choice views and her support of the Equal Rights Amendment. During her husband’s two terms as vice president, Barbara Bush championed literacy as her signature cause, joining the board of the children’s organization Reading Is Fundamental. As her son Neil was dyslexic, it was an issue particularly close to her heart. Former US first lady Barbara Bush with her son then-President George W. Bush, 2005. In 1988, Barbara Bush was diagnosed with Grave’s disease, an autoimmune disorder that affects the thyroid. She began taking medication and underwent radiation as treatment for the illness. After her husband won election to the White House that year, Mrs. Bush launched a fashion trend by donning a triple-strand necklace of faux pearls at his inauguration, which she later said she wore to cover the wrinkles on her neck. 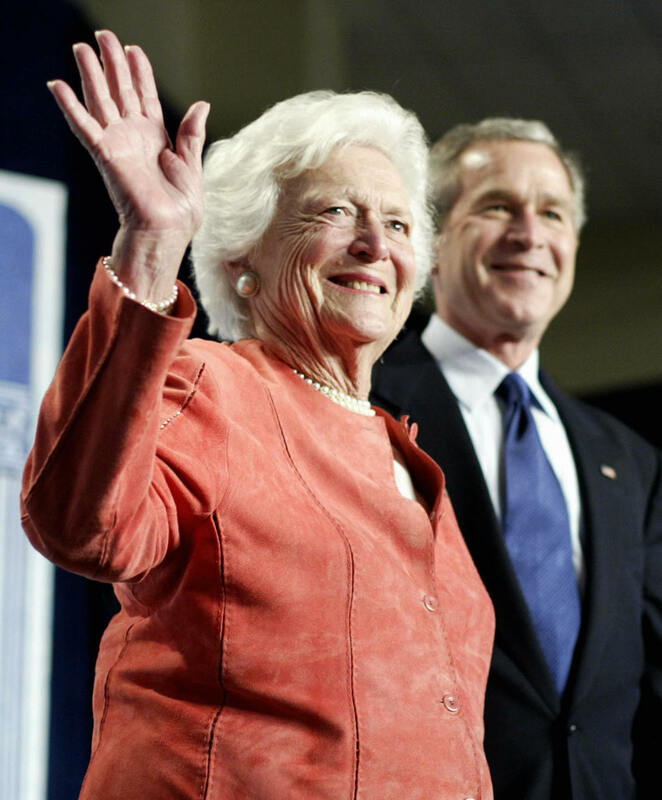 Bush expanded her work with literacy as first lady, serving as honorary chairman of the Barbara Bush Foundation for Family Literacy, which since its inception has awarded more than $42 million to some 1,500 literacy organizations across the United States. She also authored two children’s books: C. Fred’s Story (1984) and Millie’s Story (1992), written from the point of the view of Bush family dogs. Mrs. Bush also won the public’s admiration for her candor, self-deprecating wit and sharp sense of humor, all of which seemed delightfully at odds with her grandmotherly appearance. 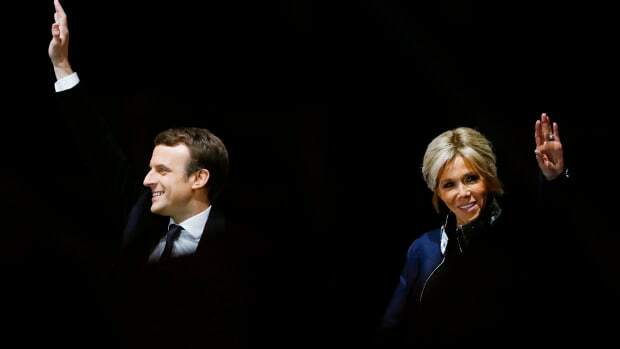 Despite her strong will, she fashioned herself as a return to a more traditional, conservative version of a first lady, making it clear she did not have her own political agenda apart from her husband’s. This put her in stark contrast with her predecessor, Nancy Reagan, as well as with her successor, Hillary Rodham Clinton, and made her exceedingly popular throughout her tenure as first lady, even as her husband’s own ratings began dropping precipitously in his final year in office. After they left the White House, the Bushes returned to Houston, and divided their time between their home there and the family compound in Kennebunkport. While retaining a prominent role in her namesake literacy foundation, Barbara wrote and published an autobiography and served on the boards of AmeriCares and the Mayo Clinic. In 2000, she saw her eldest son, then Texas Governor George W. Bush, win election to the first of two terms as the 43 president of the United States. That same year, Barbara and George H.W. Bush surpassed the record for the longest presidential marriage in the nation’s history (previously held by John and Abigail Adams) when they celebrated their 55 wedding anniversary. 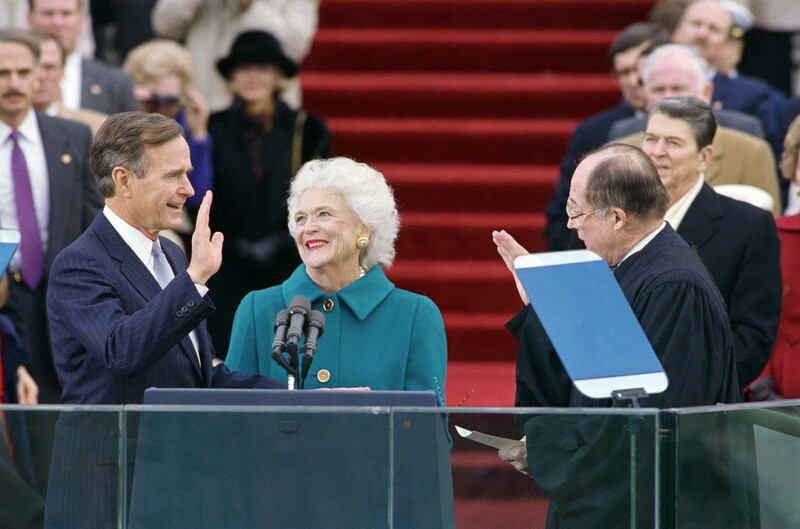 Barbara Bush, lovingly looking on as her husband George Bush is sworn in as President of the United States. While her son was in the White House, Barbara remained a vibrant presence in the wings, offering colorful (and sometimes controversial) commentary on the political scene. She continued to air her opinions during more recent presidential elections, even as her health declined. Though Mrs. Bush reportedly opposed the idea of her son Jeb running for president initially, she campaigned for him in 2016, and along with her husband didn’t hesitate to voice her disapproval of eventual Republican nominee Donald Trump. After being hospitalized in late 2013 with early signs of pneumonia, she was discharged in early 2014, but her health continued to deteriorate. The announcement that she would stop seeking aggressive medical treatment elicited an outpouring of support and affection from friends, former Bush aides and even political opponents. Barbara Bush’s legacy as America’s leading modern political matriarch includes the memorable commencement address she delivered in 1990 at Wellesley College in Massachusetts. Some 150 students had signed a petition of protest against the choice of Mrs. Bush, a woman who they said “has gained recognition through the achievements of her husband,” as their commencement speaker. In her speech, Bush chose to focus on a familiar socially conservative theme, the importance of family.